This week we’ve prepared a classic Greek dish for you. 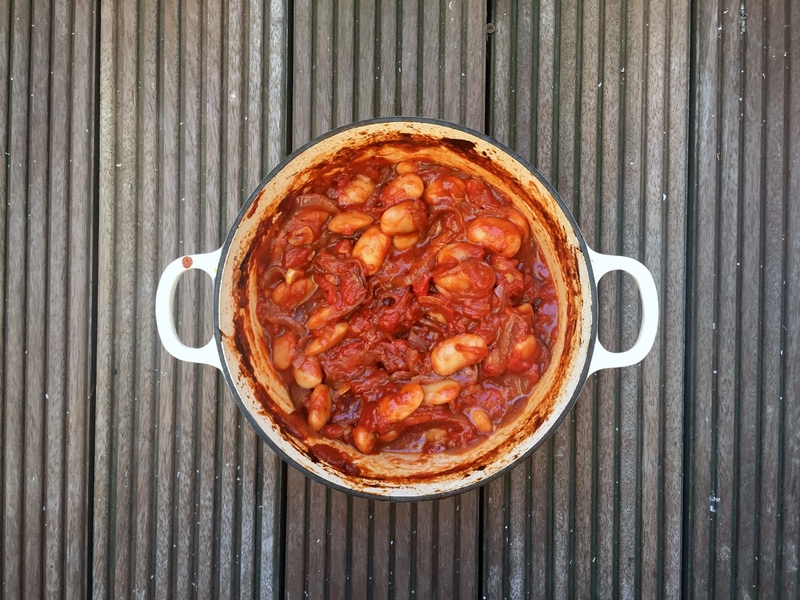 Oven baked gigantes beans is one of the most iconic Greek dishes. With a bit of crusty bread and feta cheese, it makes for an excellent, filling meal. Of course, this recipe is not the classic one, but has a few interesting new twists. We’ve added a bit of grape molasses to add some sweetness and depth to the tomatoes. And what we are very excited about, we are serving it with our extra virgin olive oil & oregano essential oil! This is a product that combines the unique health benefits of our Greek oregano organic essential oil with a special organic, extra virgin, cold pressed, single variety Greek olive oil. This unique food pairing tastes like the Greek sunshine. And it is perfect to enjoy with this classic Greek dish! Finely slice the red onions and garlic. In a frying pan and over medium heat place the olive oil, onions and garlic. Cook until caramelised, for around 10-15 minutes, adding the grape molasses half way through. Once caramelised, placed the onions, garlic and all the juices from the frying pan in an casserole. Add the beans, tomato passata, salt, dried oregano and 200ml of water. Bake covered for 20 min. Uncover and bake for another 20min, until the liquid has evaporated and you are left with a mellow bean stew. Serve with plenty of extra virgin olive oil & oregano essential oil! This entry was posted in Recipes and tagged beans, oregano, oregano oil, pulses, tomatoes, vegan.